7218S 0-8inch .001inch 1.0inch Measuring Force: 2.0N or less Base Length: 4.0"
The Dial Indicator has a precision-ground, hard-chromeplated stem with standard AGD 3/8" diameter. Contact point is hardened, ground and chrome-plated steel. Spindle rack, pinions and pivots are hardened stainless steel to insure long wear and continuing accuracy. Bezel is cleanly knurled and smoothly adjustable with a clamping screw for positive settings. 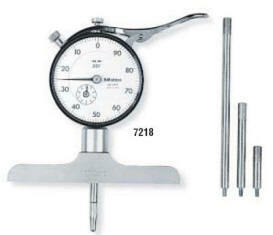 Accuracy of the Dial Indicator exceeds Federal Specifications. Rods are available in 1", 2" and 4" lengths and may be connected for depths up to 8". (1" on Dial Indicator + 1" rod + 2" rod + 4" rod = 8".) 10, 20, 30 and 100mm rods for Metric model. Spindle lifting lever for raising and lowering and spindle is maintained under spring pressure. Bottom surface of the base is hardened, ground and lapped for highest degree of flatness. Complete with fitted carrying case.